For much of the time since Brooklyn-based rap group Das Racist called it quits in 2012, founding member Himanshu “Heems” Suri has been hard at work in Bombay on his debut solo album. Evidently, though, Heems managed to find the time to collaborate with Vitamin Water on what’s been dubbed the “New York remix” of a commercial airing in Japan that’s so unbelievably absurd, only a character like Heems could completely nail it. 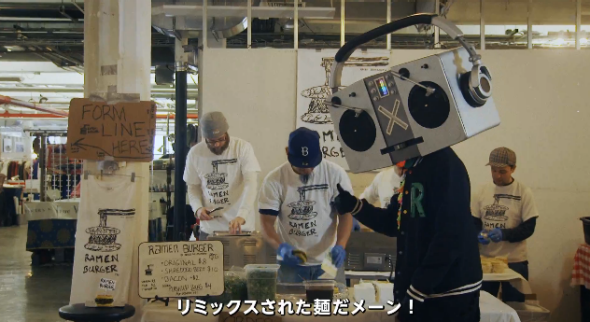 The ad, which stars a dancer wearing a boombox for a head, finds Heems nonsensically rapping about what it calls NYC’s signature mashups: clubbing and bicycles (spin class), fashion and Japanese cuisine (sushi nails), and so on, Japanese subtitles included. Sadly, though, Heems says he’s not the one inside the boombox head (“I only Usher slide for Yoko Ono,” he explained). If this is Heems’ way of paying tribute to Lost In Translation’s Suntory Time, we’re all for it.